It’s that season of politics again – when you can hardly go out to eat at a Pizza Ranch without bumping into a Republican Presidential contender seeking your vote and support in our first-in-the-nation caucuses that are scheduled to be held next February. As Iowans, we have a special role to play in determining what candidates emerge as viable contenders for the national stage. As Iowa’s largest gun rights organization, Iowa Gun Owners and her members have a special role to play as well: educating Iowans about what candidates are pro-gun and exposing those candidates who are desperately trying to hide their anti-gun records. And that’s exactly what Iowa Gun Owners’ staff and volunteers were doing last week Friday when anti-gun US Senator Lindsey Graham made his first trip to Iowa as an official Presidential candidate. You see, while Senator Graham and his staff are trying to reassure Iowans that he supports your 2nd Amendment rights, the facts paint a far different story. Maybe that’s why Lindsey Graham’s Super PAC was awarded a $250,000 payout from billionaire gun control czar Michael Bloomberg just last year when Graham was going through a withering primary from pro-gun activists in his home state of South Carolina. That’s why last Friday morning Iowa Gun Owners’ staff and volunteers went to the Sheraton Hotel in West Des Moines to confront Senator Graham – to get answers. Once Graham opened the floor for questions, I immediately asked him about this history of backing gun control and anti-gun Attorney General and Supreme Court nominees. Graham’s response to a detailed listing of his 2nd amendment abuses: scoffing, contempt, and absolutely no remorse. You don’t get everything you want in DC – but if you elect me President you’ll get pro-gun nominees in the future. Your record is abysmal, you’ve let gun owners down over and over, gun owners in your home state primaried you because of your record – but when you arrive in the White House you’ll suddenly defend our gun rights? Senator Graham clearly thinks that gun owners in Iowa are stupid and that he can bamboozle us with a handful of scoffing one-liners. And it’s obvious that his staff is clearly worried that the word will get out. As I was speaking with Senator Graham, volunteers with Iowa Gun Owners were passing out flyers in the parking lot to make sure that the attendees had a copy of Graham’s anti-gun record. 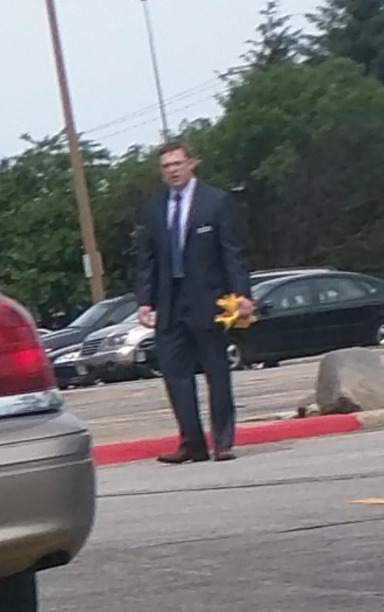 Graham’s staff began to get aggressive with our volunteers and then began to physically remove flyers from cars in the parking lot – technically a violation of the law – as you can see in the picture below. Senator Graham certainly can choose to refuse to answer my questions and his staff can continue to childishly steal information flyers in an attempt to hide the facts. But Graham can’t refuse to answer your questions – not if he wants to become President. So the next time you see Lindsey Graham in Iowa be sure you demand answers to these questions! Insist that he apologize for taking money from America’s anti-gun BILLIONAIRE Michael Bloomberg. After all, gun owners in Iowa spent most of 2013 and 2014 trying to stop SF233 and SF2179, universal registration legislation which was being pushed by anti-gunners in the Iowa Senate. Insiders say that former Senator Daryl Beall lost his re-election last year because Iowa Gun Owners exposed his willingness to sponsor Bloomberg-styled Universal Registration legislation! So it’s outrageous that this Republican candidate for the White House is willing to do the bidding of and accept money from the very nemesis we’ve been working to stop here in Iowa for the past two years! Make sure he hears from you. And if you can, please consider a generous contribution to help Iowa Gun Owners get the word out to tens of thousands of gun owners across the state as they begin to interact with these candidates! Your contribution of $50, $35 or even just $10 will enable me to keep our statewide social media and email programs running at full throttle. Please stay tuned as we’ll have much more information coming out in the coming weeks about the different candidates seeking your support. In the meantime, make sure Lindsey Graham hears from you! 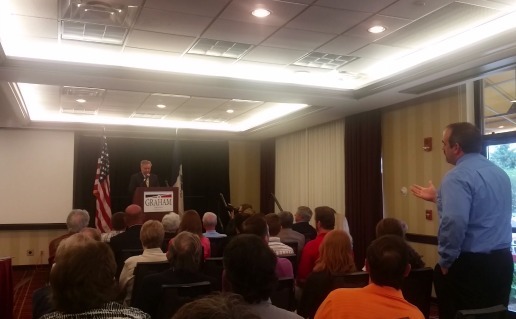 P.S Last week, Iowa Gun Owners staff and volunteers confronted Presidential candidate Lindsey Graham about his long history of supporting gun control, voting for anti-gun Attorney General and Supreme Court nominees, and for accepting a whopping $250,000 from Michael Bloomberg. Graham’s utter contempt for gun owners and for those who dare to question his anti-gun voting history was on full display. Graham and his staff were desperately trying to make sure that his record didn’t come out – in fact member of his staff were illegally removing flyers that our volunteers were passing out at the event, as you can see in the picture above. So the next time you see Lindsey Graham in Iowa, be sure you demand answers to these questions! And remember, if you can make a $50, $35 or even $10 contribution to Iowa Gun Owners to help us keep the pressure up, I’ll put it to immediate use!